It’s been a growing trend, over the last decade or so, for Americans to renovate their bathrooms – especially master bathrooms – creating spaces that feel just like luxurious spa-like retreats. And it’s never been easier or more affordable than today, as many companies have joined in to offer incredible products that help create that environment. 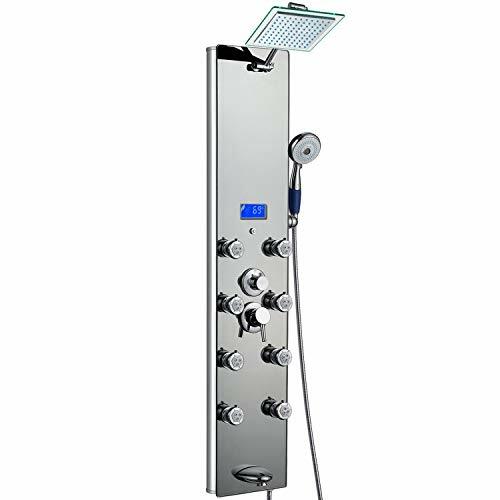 One of those products is the Shower Panel System, which is a single unit that mounts on your shower wall, and includes the shower flow/temperature valve, horizontal body jets, handheld shower wands, and overhead shower head or rainfall heads. 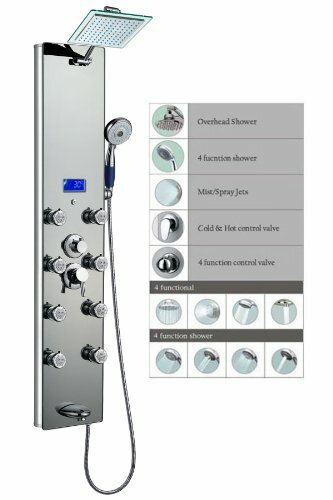 It’s an all-in-one system that delivers a spa-like, massaging, relaxing, luxurious shower every time you step in. It’s impossible to know your exact situation, the styles that fit your taste, and what budget you have, but we’ve weighed all the factors to come up with our Top 3 Picks that would generally be the best fit for most people. Here are our favorite shower panel systems that will help turn your bathroom into a spa-like oasis! It’s on the lower end of the price range for shower panels, and has about 100 4 & 5 Star reviews on Amazon! With well over 250 positive reviews on Amazon, the people have definitely spoken, giving their approval for this model. And being priced in the mid $200s, it’s hard to beat that price as well. Although it’s at the top of the price spectrum, we chose this model for our #3 pick because of it’s stunning beauty & design. If your budget allows for it, getting the Pulse Mojave shower system would help you create the most beautiful, relaxing, and impressive spa-like shower. How Do You Install A Shower Panel System? The vast majority of shower panel systems available today are designed to be very easy to assemble. Little assembly of the unit itself is usually needed, and if assembly is required, it’s something simple like screwing/attaching the shower head arm or handheld wand to the main panel. If you have an existing shower, the current diverter valve will need to be removed, and a washer plumbing wall box or something similar will need to be installed in the wall, with hot and cold shutoff valves in the box. You’ll see details on this in the videos below. Pulse is the maker of these shower panel systems available on Amazon (some that we reviewed above). Valore shares how to install their shower panels. The ToolTutor YouTube Channel shows how to install a new shower panel, including changing the plumbing in the wall to fit the new shower panel system. Frequently Asked Questions About Shower Panel Systems? Q. 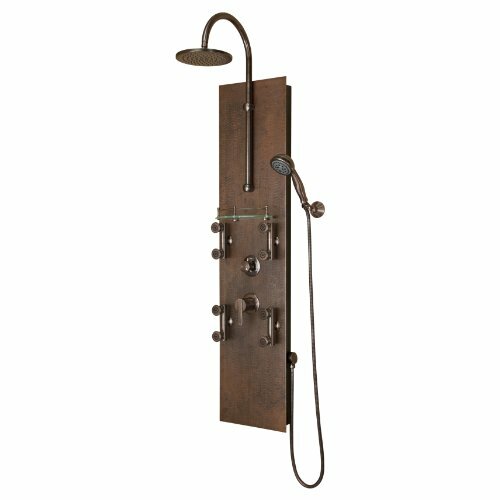 Which Shower Column or Shower Panel Is Best? A. It’s impossible for us to say exactly which shower panel is best for your specific situation, since budgets, tastes, and shower setups all vary widely. But, in the reviews above, we’ve done our best to share as many of the key features with you as possible of the top rated, best selling shower panel system models available. We provide price ranges, ratings, features, and other important information, for your comparison. Lastly, we sifted through the reviews, and weigh out all the factors to come up with our Top Shower Panel System Picks, which we think would be best for the average shower project, for a person with an average budget…you may have the taste for something more custom and higher quality. If that’s the case, we recommend you go with the one that has the look & design that appeals to you and hast the best ratings. Q. How Do You Install A Shower Panel System? A. As mentioned above, a shower panel system comes mostly assembled, and is installed onto the shower wall using an included metal mounting bracket. You may need a tile drill bit to drill a few holes in the tile where anchors need to be inserted into the wall. You will also need a valve box in the wall containing hot and cold water supply valves. If a shower currently exists with a mixing valve in the wall, it will need to be removed, and the valve box installed, with plumbing being connected to it. Take special care to ensure you buy a water supply wall box that is narrower in width than the width of the shower column, so the recessed valve box opening doesn’t protrude from the sides of the shower panel. Once the water supply valve box is in place, and tile or other surface of the shower is finished, you’re ready to simply install the mounting bracket(s) included, attach the water supply hoses on the back of the shower panel system to your supply valves, and then hang the shower column on the wall mounting bracket(s). If you purchased a shower column with LED display, there may be a box on the under side of the shower panel where you need to install the battery that supplies power to the LED display.